The weather has been sort of schizo lately - one day hot, the next day cold. It seem like we will never settle down into any particular season's weather at this point and are to remain in seasonal limbo until the dog days of summer finally arrive. Which brings me to the subject of sweet bean soup. In the West, bean soup equals savory soup, a toe-warming and usually meat-based bowl of winter pleasure. But in China, bean soups more often than not are sweet. Although this may seem odd if you have never tried it, sweet bean soups are delicious, offer infinite variety, and can be served hot in cold weather and cold in hot weather. Two kinds of beans are generally used here: red (adzuki) beans and green (mung) beans. The weather generally determines what kind of bean is used. Red beans (hongdou) are considered warming, and so they are most often used in hot soups, although they do make guest appearances in such summer treats as red beans over shaved ice, red bean ice cream, and so forth, because they have a distinctive taste and unique texture; their skins are tender, so the only way you'll find red beans is au naturel in their little red birthday suits. Green beans, as you may have surmised by now, are cooling, and so summer soups will feature them since they not only taste great but help to dispel the heat. Green beans (lüdou) come in two forms: peeled and unpeeled. Unpeeled green beans are what you usually find in natural food stores; the skins of the beans are intact, and it's easy to see how these beans got their name. Less common, but perhaps even more intriguing, are the skinned green beans, which are yellow. Green beans in their natural state have rather tough skins, and this is fine if you are serving rustic soups, but if you want to have a smoother texture, the peeled ones fit the bill to a T. In fact, once the peeled beans have cooked and softened, they turn into a smooth mass that mingles easily with any other ingredients that happen to find their way into the pot. Another good reason t0 use peeled green beans is that they do not require soaking; just an hour or so of gentle cooking will result in a perfect bowl of smooth soup. One of our favorite versions is peeled green beans cooked until they are soft, and then small tapioca is stirred in to lighten up the soup. Finally, condensed milk is added to bring sweetness and a touch of richness to the soup. It is very good hot, but when chilled, this soup takes on a genuinely decadent texture. Tapioca probably came to China via Southeast Asia, which is why the Chinese name for tapioca is Xigong mi (Saigon rice), or Xi mi for short. 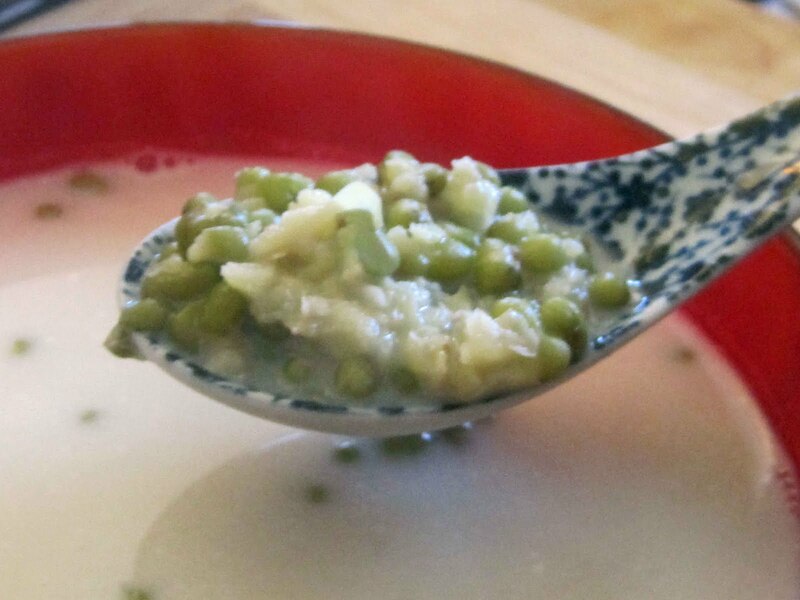 Sweet soups with tapioca and coconut milk are very popular throughout southern China, but the unpeeled beans make appearances throughout much of the northern and eastern areas; this, then, is one of those types of foods that has fans all over. The heartier second soup also can be served hot or cold or whatever suits you. They both are classics that can be gussied up or dressed down depending upon your whims and what is hanging around in your pantry. Feel free to use the condensed milk with the unpeeled beans and coconut milk plus sugar for the peeled ones. Or, you can omit both milks and just serve the soup slightly sweetened. Hot, cold, room temperature... these two soups are completely versatile and accommodating. 1. 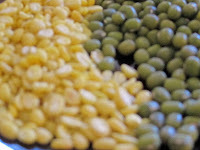 There is no need to soak the peeled beans, so just pick them over and toss out any debris or stones, rinse them off in a sieve, cover them with about 4 cups of the water, bring the water to a boil, and then lower the heat to a simmer. Cook the beans until they begin to fall apart. 2. 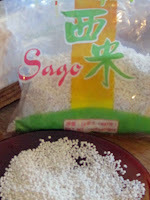 Boil the remaining 3 cups of water and add to the pot before stirring in the tapioca pearls and salt. 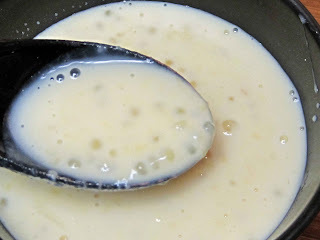 Bring the pot to a boil and then lower the heat to medium-low so that the beans barely simmer; cook until the tapioca is transparent (although a little bit of white in the center is all right). 3. Remove the pot from the heat and stir in condensed milk to taste. If you plan to eat this soup hot, half to three-quarters of a can will probably provide enough sweetness, but add more if you are going to serve this chilled, since the sweetness will be less noticeable if the soup is cold. Add more water if you want the soup thinner. Store covered in the refrigerator for up to three days. 1. Start this recipe at least the day before you want to serve it. Pick over the beans carefully and remove any stones or foreign matter. Place the beans in a medium work bowl and cover the beans with tap water. Soak the beans at least 8 hours or overnight. 2. Drain the beans, rinse them well, and cover them with half of the filtered water. Bring the water to a boil, boil the beans for 10 minutes, and then dump out the water and rinse the beans well; this will reduce some of the unpleasant aftereffects that beans tend to offer. 3. Cover the beans with the rest of the water, bring the pot to a boil, and then simmer the beans over medium heat until they start to fall apart. 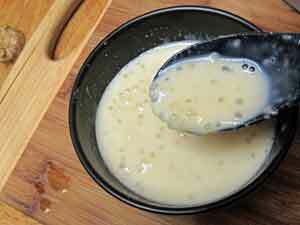 Add the tapioca, if you are using it, and simmer the beans until the tapioca is almost translucent. 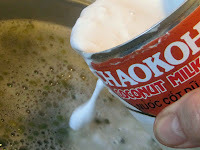 Pour in the coconut milk, if using, as well as the salt and sugar to taste. Simmer until the sugar is dissolved. Serve hot, at room temperature, or cold. 4. As with all bean soups, these are high in protein, and so they spoil easily. For that reason, try to eat them up in a few days and always keep them refrigerated. Would love to try my hand at the hot green bean soup with coconut milk to get that balance of sweet, creamy cooling heat. I love this soup. Im 1/2 Chinese and I eat this all the time and my mom and grandma can make it, but I was craving it one day and my mom was out of town and I surprised her by making this. I am not an experienced cook and I made it successfully, thanks for a great recipe of one of my childhood favorites and comfort foods.